David Ewing wore a bright white dust mask, his face behind it puffy and red, as he sat on a stone bench in downtown Santa Barbara, California. A fine layer of ash covered the pavement at his feet, dirty residue from wildfires ravaging the region. Smoke from the Thomas Fire, viewed from Santa Barbara on December 5, 2017. Ewing is among the tens of thousands of homeless in Southern California who are struggling to escape the smoke as wildfires tear through the region. 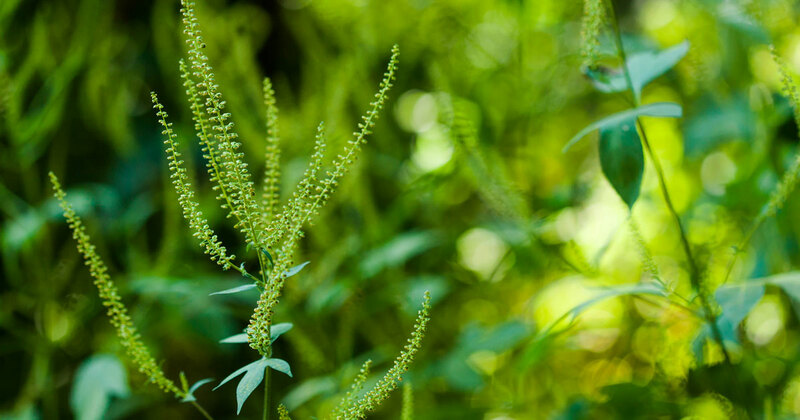 Experts caution against spending time outdoors when it’s smoky, but for many, staying inside isn't an option. This story was produced through a partnership with Pacific Standard. 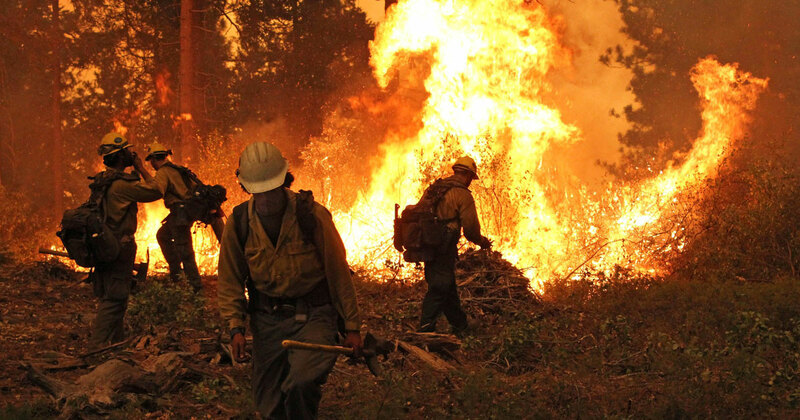 It's part of a Climate Central series on wildfire pollution, climate change and public health supported by the Bill Lane Center for the American West at Stanford University. Climate Central also published a research report on this topic. Wildfire seasons have been growing longer and more severe throughout the American West. 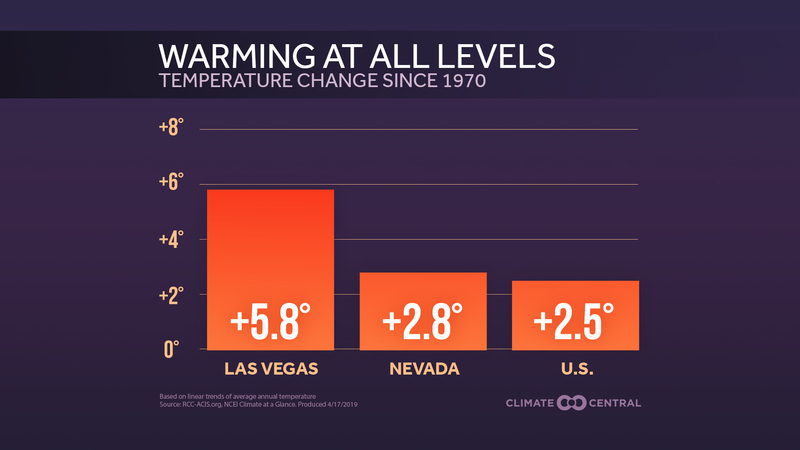 Heat-trapping pollution and the effects of weather cycles have pushed up temperatures. Meanwhile, saplings and other fuel for fires has accumulated in forests. That’s stoking blazes that are undermining long-running efforts to clean the air using environmental regulations. Wildfire smoke can travel hundreds of miles and blanket valleys and regions, creating what scientists call smoke waves. Smoke waves are pulses of bad air caused by fires that linger stubbornly for days, similar to heat waves. Smoke contains chemicals from burning rubber and homes. It can also worsen ozone pollution. And it’s filled with tiny particles known as PM2.5, which can lodge inside lungs, trigger coughing, worsen diseases like asthma, and lead to long-term damage including cancer. Climate change-focused research published in the journal Environmental Research Letters a year ago concluded smoke could send 30 more people to hospitals across the West each year during the late 2040s than was the case 40 years earlier as smoke waves become more frequent and severe, mostly in the late summer and early fall. Some counties were projected to see little or no change. Impacts could be heavy in parts of central Colorado and Washington — and in Southern California. As with most pollution, the poorest and frailest are the most vulnerable to smoke waves. A U.S. EPA study of emergency room visits linked to a North Carolina wildfire that burned in 2008 showed health risks from PM2.5 increased in the counties with the poorest residents and with the greatest levels of income inequality. 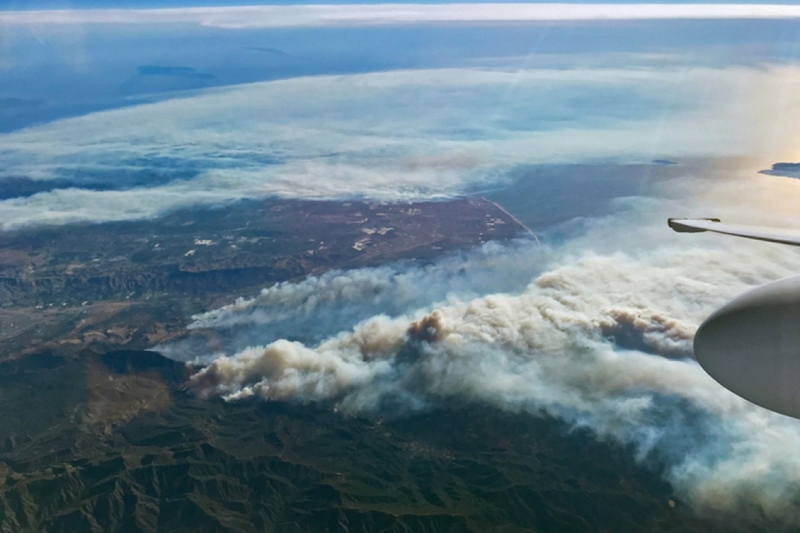 Wildfires tore through Southern California this week fueled by hot and dry seasonal winds — called Santa Ana winds — blowing over landscapes left parched by an unusual absence of fall storms. 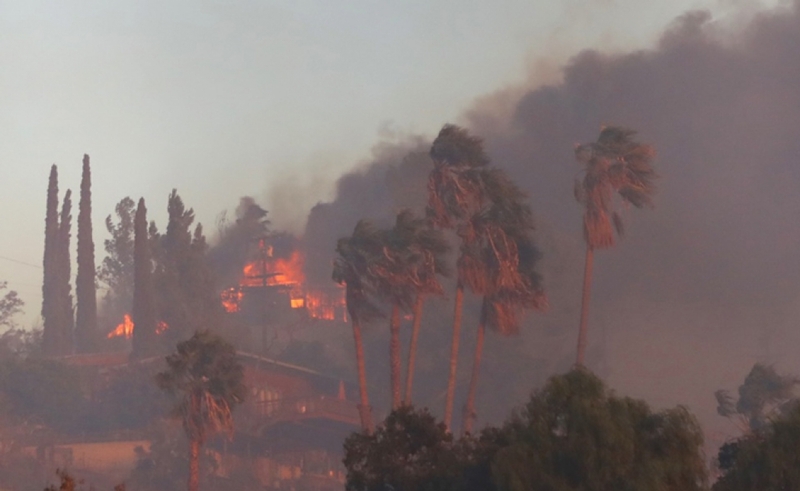 The largest blaze, the Thomas Fire, which raced across the hills of Ventura, was stopped only by the Pacific Ocean after the flames hopped the 101 freeway. At least three others scorched the hills above Los Angeles. 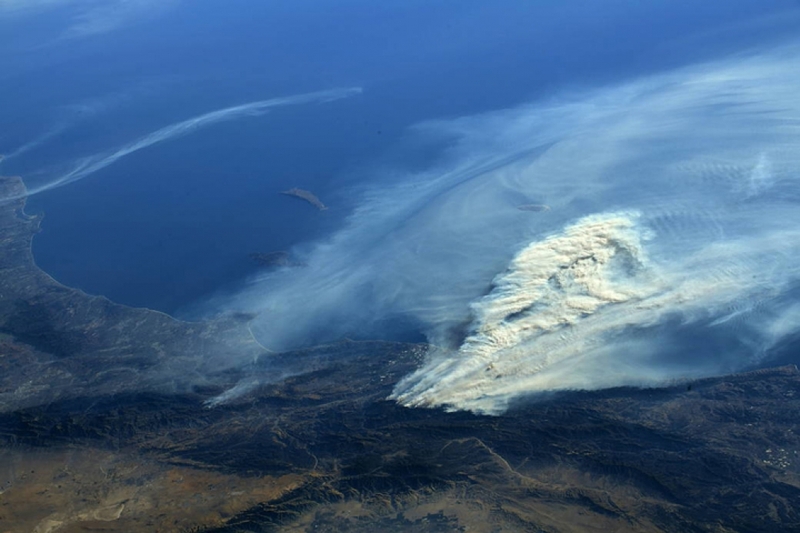 Photos of the explosive Thomas Fire shown here on December 5, 2017 taken from the cockpit of NASA’s high-flying ER-2 aircraft. Homes and palm trees burn in the Creek Fire outside of Los Angeles, California on December 5, 2017. The conditions stoking the blazes in Southern California are projected to become more common and severe in the years ahead as greenhouse gas pollution from fossil fuel burning, deforestation, farming and other industrial practices accumulates in the atmosphere, changing temperatures and rainfall patterns. As a thick yellow haze filled the air this week, air quality alerts went out warning residents outside of evacuation zones to seek shelter. Winds late in the week were pushing the smoke far up the California coast, over the Silicon Valley and into San Francisco, affecting millions. “It’s been very difficult for outpatients to breathe,” said Laren Tan, a pulmonologist at Loma Linda University in San Bernardino County. He tells patients to stay inside as much as possible when smoke waves hit, and to close their windows and use air filters. But even getting indoors can be a major challenge for the homeless in L.A., one of the only U.S. cities where homelessness is rising. In 2017, the number of homeless people climbed to over 55,000 — up more than 13,000 from the year prior. 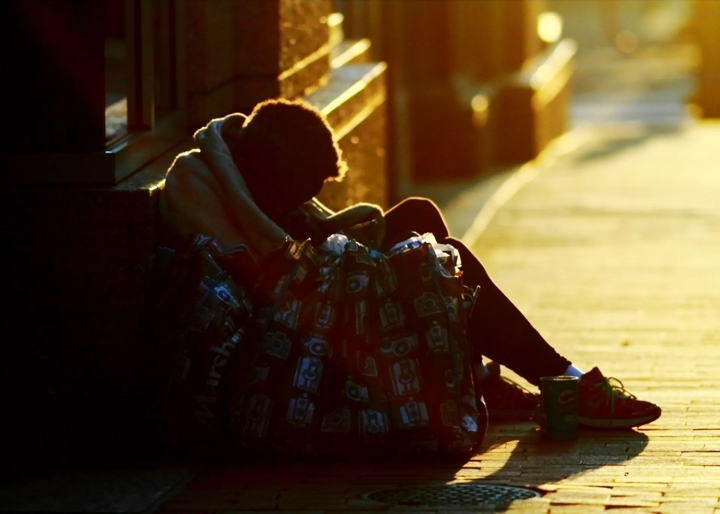 L.A. also has the largest unsheltered subpopulation of any big city, according to Colleen Murphy, an outreach coordinator for the L.A. Homeless Services Authority. Since the fires began, outreach teams, which sometimes include medical and mental health professionals, have fanned out across the city to try to get people off the streets and into the city's shelters or a Red Cross facility. The southern California wildfires could be seen by the International Space Station crew from their vantage point in low Earth orbit. In Ventura County, where as of Friday the Thomas Fire had burned 132,000 acres and more than 400 buildings, workers at the transitional living facility operated by county officials were handing out masks. Some of the homeless are turning up at evacuation shelters as well. The fires have struck Southern California at an unusual time and with rare ferocity, bookending a deadly wildfire season that destroyed neighborhoods and killed dozens in wine country north of San Francisco and filled the sweeping Central Valley farming region with smoke from forest fires in mountains nearby. The blazes are part of a years-long fiery crisis for the West — one that’s only expected to get worse.